This is the Morgan Italian vinyl wallet in black. It is a zip-around unisex wallet. 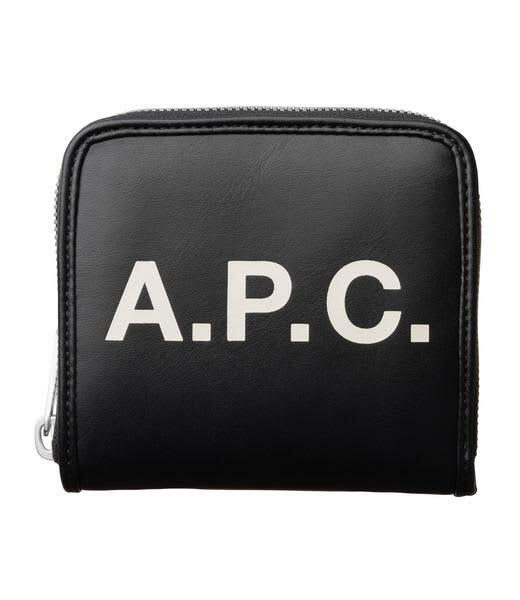 Features rounded corners with a zip closure and a bold A.P.C. contrast printed logo on the exterior. Inside there is a five slot cardholder, gusseted coin pocket with snap flap and banknote pocket. Dimensions: 11 x 10 x 3 cm. Topstitched edges. Vinyl lining. Silvertone hardware. Completely vegan.